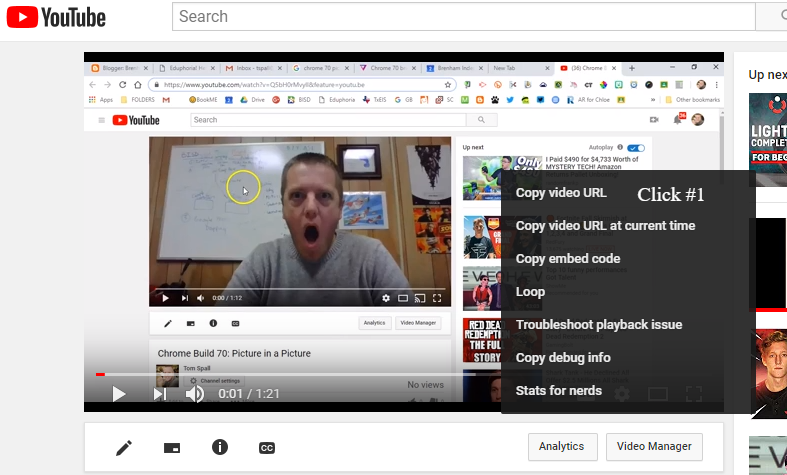 With the new Chrome 70 build, you are now able to have a new video mode called, picture-in-picture. This new mode will allow you to to overlay an online video onto your desktop, across multiple Google Chrome accounts, and while your flipping through your tabs. You can go check it out right now! Go to YouTube, and find a video you'd like to watch. Right-click on any video twice and click "Picture in Picture" from the context menu. When this new mode is enabled, you will see an icon on the tab that indicates the video is now being played in the "picture in picture" mode. The video overlay can be moved anywhere on the screen when you drag and drop. Currently, YouTube supports this functionality, however, it's up to the developers to decide when to add it to their websites (facebook, twitter, and other locations where you have videos). This is also GREAT for anyone not able to have two monitors while working. Now you can watch the video and work at the same time! And Presto!!!! You now have your very own "picture in picture" mode enabled! Enjoy!! !